Adium, the people’s favorite alternative to iChat, gained two shiny new releases on Monday that bring a “ridiculously long list of improvements” and obligatory bug fixes. Since the beta release is easily the more interesting of the two, we’ll start there. 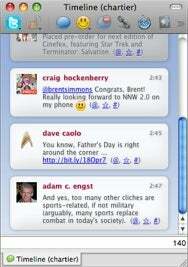 Adium 1.4 beta, available from the Adium beta site, brings support for what are likely two of the most-requested features in the application’s history: Twitter and IRC. This new version also gains an updated core network engine, a new aggregate authorizations window, and a lot of changes to the way group chats work and can be customized. For instance, a group’s tab will change color when your name is mentioned in the room, and message styles can now be customized separately for groups and regular chat windows. Other Adium 1.4 changes allow for contacts to be placed in multiple groups and enabling Adium’s buddy search feature (start typing while selected on the buddy list) to work in all window styles. The full list of changes in Adium 1.4 beta is truly quite extensive, so check it out if you’re interested in the finer details. Interestingly, Adium 1.4 beta marks a new requirement: Mac OS X 10.5 Leopard. The latest stable (non-beta) version of Adium, released today as well, will likely be the last for 10.4 Tiger users. Adium 1.3.4 is a less ambitious upgrade that brings the same new core network engine as the 1.4 beta, as well as an updated Facebook chat plug-in. Translation: If you're a Tiger user who depends on (or merely salivates over) Adium and major new feature releases, it may finally be necessary to upgrade to 10.5 or jump on Snow Leopard later this year. As usual, both releases are available as donationware from the Adium and Adium beta sites.